The Winter Meetings in Nashville have come and gone for the Twins with no deals, including the decision to pass on this year’s Rule 5 draft. The team, though, left relief pitcher Zack Jones unprotected and he was taken by the Milwaukee Brewers. Jones, according to MLB.com, was ranked as the Twins’ No. 23 prospect. Last season at both Class A Advanced Fort Meyers and Double-A Chattanooga he recorded 68 strikeouts in 51 2/3 innings with an ERA of 4.53. MLB.com also notes that the Brewers must keep Jones on their 25-man roster all season or offer him back to the Twins for $25,000. Although the Twins did not make a pick in the Rule 5 draft, it has proven to be an incredible source of talent for the team, especially after the Houston Astros left pitcher Johan Santana unprotected in the 1999 draft. Santana was picked by the Florida Marlins and then traded to the Twins, according to Baseball-Reference.com. 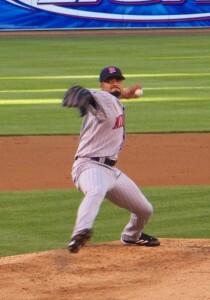 Santana would go on to win two Cy Young awards with the Twins in 2004 and 2006. He’s also a four-time All-Star. Pitching for the New York Mets, he no-hit the St. Louis Cardinals in June 2012. The no-hitter is impressive, but Santana also struck out 17 Texas Rangers in eight innings for the Twins on Aug. 19, 2007. He walked none, gave up two hits and threw 112 pitches to cruise to a 1-0 victory. Joe Nathan recorded the save. Santana, plagued by injuries since leaving the Twins, will be remembered for two pitches: his fastball and change-up. In fact, I’ve never seen a more deceptive change in speeds from a pitcher. He would set up the slow ball so well with his fastball that it really did look as if the ball had stopped mid-flight, as if Santana was throwing a yo-yo and not a baseball. Johan Santana: bringing the heat. Meanwhile, Michael Cuddyer, who spent 11 of his 15 seasons in the majors with the Twins, has apparently called it a career and retired. Cuddyer, who usually played right field, had some good years for the Twins. He had 109 RBIs in 2006 and hit 32 home runs in 2009, but his best season was in 2013 with the Colorado Rockies. He won the National League batting title that year after he hit .331.